While this is definitely too late to prep for Thanksgiving today (unless you happen to have Pumpkin vodka sitting around the house), it’s an easy recipe and the infused vodka is delicious. If you’re on the look-out for last minute recipes for Thanksgiving, check out Alisa’s great thanksgiving link page. Roast the pumpkin fresh, don’t do canned – that’s gross. For how to roast a pumpkin, check out this blog (it’s easy). After the pumpkin has cooled off a little bit, combine all ingredients in an air-tight container. Place in a cool place for 1 week. My garage in the middle of November was cool enough. Strain the infusion. I used a metal strainer for pass #1 and then a cheese cloth for pass #2. Combine first four ingredients in a cocktail shaker with ice. Shake. Rim each martini glass with agave nectar and toasted almonds. Pour mixture in the glasses and top for nutmeg. 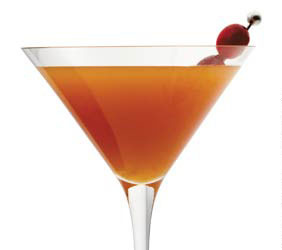 For the calorie counters in the group… the cocktail is about 260 calories, 4g of fat, 21g of carbs, and minimal protein. This is a mainly music-based blog. If you stumbled in on a recipe search, check out my other recipes, like vegan biscuits & gravy, spiced biscotti, vegan cactus chili, vegan bananas foster, mushroom dumpling stew, strawberry cornbread muffins, fruit spring rolls, grilled coconut-rum pineapple, and vegetarian s’mores pouches at THIS LINK.